I am writing to you to let you know that one of our own is not only serving our community well but wants to serve all of the people of San Luis Obispo County. I read the Tribune’s poorly thought out and one-sided editorial recommendation. I don’t believe the Tribune will actually publish a letter that comments on their lack of looking at the issues fairly. That is why I am turning to our home town news who I believe will try to get it right. It is unfortunate that the Tribune editorial board does not get the opportunity to practice law in our courthouses, each and every day. If they did they would have gotten to know Mr. Ilan Funke-Bilu. He is there with a smile and encouraging word for all. He is a man who treats all people with dignity and respect. Justice is served when people are heard and treated fairly. Ilan Funke-Bilu is that man. He is a great trial attorney and will be a great Judge for this County. Ilan Funke-Bilu is the current Central Coast Trial Attorneys’, Trail Attorney of the Year, and has won this honor three times. Ilan Funke-Bilu is a certified specialist in criminal law, one of only two people who hold that honor in this county. 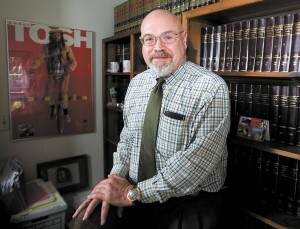 Ilan Funke-Bilu has tried more jury trials than any attorney in this county. He represents people from all walks of life and served as a check and balance against the powerful system that arrests, imprisons and prosecutes people. Mr. Timothy Covello is the man who was second in command at the DA’s office and got virtually no support from any of the deputy district attorneys who worked for the office. In fact, during Covello’s campaign he referred to them as being lazy. His experience as a commissioner has been two years. It was then, as the insider, that the judges appointed him without posting the position to find the most qualified applicant for the position. The judges wanted an insider, not a fair and impartial bench officer who would relate to the people. As I understand it, Mr. Covello has an almost perfect record of convicting people with infractions. He is really good at finding people guilty of moving violations. We have a lot of rubber stamps for district attorneys already on the bench. We don’t have community stake holders that represent real people on the bench. This creates a huge disconnect between those who are governed and those who run the justice system. Let’s change that. Vote for Ilan Funke-Bilu on June 5th! A man of the people, for the people. I had an open mind about this race, but during the candidates’ forum, they were asked which sitting judge inspired them the most. Funke-Bilu’s answer was the late Justice Antonin Scalia. Scalia’s gift to us included GW Bush, the Iraq war, the War on Terror, Afghanistan, the Taliban, ISIS, Syria, etc, etc. All due to Scalia’s radical activist position on the 14th Amendment and his disrespect for the Florida court’s attempts to obtain a fair and accurate vote count. Funke-Bilu, just like the Justice he unconditionally admires, is too clever by half. Hahahaha anyone who understands the corrupt politics of this election and the individuals involved would be 100% behind Tim Covello. Registered republican who refuses to vote blindly in support of whoever my local “republican” tells me to. Not going to convince anyone on this site to change their vote, but I wish you knew Tim. He is truly a great hard-working man who lives for the justice system, not to take advantage of it. The article is right on. Our legal system is probably the best in the world although it does have its flaws. Politics is a big part of the system, sometimes more than equal justice. We like to see equal justice where those who are connected and those who are not connected are treated equally. Funke-Bilu does have more experience in the courtroom, where justice is dealt with more than any others in our local justice system. I believe that Funke-Bilu will make sure that those who are indigent will be treated fairly and not just become victims for political purposes. As a side note it is apparent that the Tribunes endorsements have become 100% political for their cause. They have stooped so low and became so tainted that they are no longer even good to line bird cages or wrap fish. Yeah right. He’s been lying for criminal defendants for 20 years. Zero morality. The last person you want as Judge is a criminal defense attorney. Because innocent people never get accused by the police or others??? What world do you live in? It happens and especially in SLO county, another reason we need a new DA and Sheriff too. I fully concur with the endorsement of Ilan Funke-Bilu. He understands the law and he understands people. I strongly urge you to vote for Ilan Funke-Bilu for Superior Court Judge -I have known him for over 40 years and consistently throughout that time his demeanor and legal ability is to be admired. The late Superior Court Judge Christopher Money thought highly of Ilan. I doubt our local paper still has an editorial board. I think most of the editorial decisions are being made by McClatchy out of Sacramento. I endorse Mr. Ilan Funke-Bilu for the SLO County Superior Judge. I frequently have an opportunity to view court proceedings, and Mr. Ilan Funke-Bilu is about 5 times the lawyer that Tim Covello ever will be. We need top-quality jurist.